Thanks to one of our sponsors, Nature’s Legacy, I recently discovered how much I like spelt! The spelt grain is part of the wheat family and available in both whole and white form (just like wheat). Spelt is more mild than wheat though and in my opinion, especially when it’s used in baked goods, the outcome is lighter and more cake like – yes, please! I first tried spelt flour in a whole grain pumpkin muffin recipe last year, and I am not going to lie…the texture is just divine, and this recipe still remains one of our favorites. And spelt products go beyond just flour, so be sure look for whole-spelt pasta as well and try some using the pasta recipe below. Spelt is a true non-hybrid grain, it has not been hybridized or chemically altered by man (spelt is a natural cross between Emmer wheat and Goats grass). Spelt has a deliciously light, nutty flavor and has been grown and eaten around the world for thousands of years. Spelt flour can be easily substituted for wheat flour in baked goods. The gluten in spelt breaks down in warm water and mixing (which makes it easier to digest) while the gluten in modern wheats is broken down only in acid and alcohol. It can be used by people with wheat intolerance, IBS or other inflammatory problems; but for best results suspend eating modern day wheat for at least 3 weeks to be able to recognize a difference. Spelt contains all eight essential amino acids, is about 60 percent higher in protein than common wheat, and contains B viatamins, iron, potassium, magnesium, manganese, and fiber. Be sure to always choose whole-grain spelt. Today we are giving away some spelt products and also sharing a fun spelt pasta recipe (at the bottom of the post). Enjoy! $150 to purchase groceries to go along with the 100% Whole Spelt Pasta! Since 1979, Purity Foods (the creators of Nature’s Legacy and VitaSpelt) has been a worldwide supplier of certified organic food products. Their organic flour mill is one of the largest in the industry and they provide all natural organic spelt products without any additives, preservatives or artificial ingredients. Find out more about spelt and the health benefits associated with it. To find Nature’s Legacy foods at a store near you, check out their store locator on their website. Chimichurri is an Argentinian sauce commonly used there as a marinade and sauce for grilled meat. 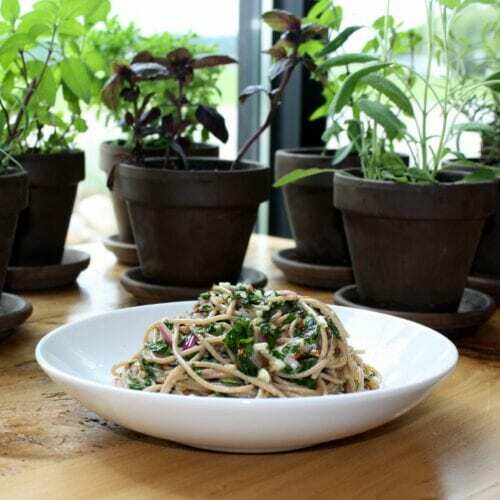 It is similar to pesto and a great use for extra herbs from your garden or the farmers’ market. It is light and zesty and therefore perfect to enjoy in the summertime. This versatile pasta could be used as a side dish next to grilled meat, or as a main dish along with some fresh vegetables or meats mixed into the pasta. There are two ways to prepare the chimichurri sauce, with everything chopped up and mixed together (much like a salsa) or by pureeing everything in a food processor. It is fun to experiment and try both techniques. Cook whole spelt pasta according to package directions. VitaSpelt Whole Spelt Spaghetti will cook in about 5 minutes. Toss cooked pasta with about 1/2 cup chimichurri sauce. Extra sauce makes a great marinade, sandwich spread, salad dressing, or salsa. Combine red wine vinegar, 1 tsp. salt, minced garlic, finely diced red onion, and chili flakes in a medium bowl and let stand for 5-10 minutes. Slowly stir in oil with a fork. Season with salt and pepper to taste. Alternate Chimichurri Instructions: Remove stems from fresh herbs. Puree all ingredients in a food processor or blender. Season with salt and pepper to taste. I love trying new things. This pasta sounds great. I love eating pasta and would certainly savor a pasta that is healthy, nourishing, and tasty. Thank you for offering this giveaway to your blog readers. I’m trying to find new and exciting ways to keep my little girl loving her whole, real foods! I am always interested in trying something new and good for you! I love to bake and have yet to try spelt. After reading this I will definitely give it a try! I love to bake with whole wheat flour. I’ve never thought to try spelt. I only use whole wheat pasta, so trying spelt sounds pretty exciting to me. bring on the spelt…. I am interested in trying spelt because it’s not processed and I think my children would like it! We eat a lot of whole wheat, but I am interested in becoming less wheat-dependent. I would love to try this, can’t believe I’m just now finding out it is as easy to use as wheat flour in recipes and that it tastes great. I recently discovered spelt tortillas and love them. But I have never seen other spelt products! Spelt pasta would be wonderful; my family would love to give it a try. I am interested because I am currently hooked on spelt pretzels so I figure i’d probably love spelt pasta as well. :) Thanks so much for the chance! The more our family eats “real foods”, the happier we are! I have been hearing more about spelt and am eager to try it. The less dependent we can be on one grain, the better for all. Plus I’m very intrigued by the “nutty” taste description! Thank you for the drawing! I would love a healthy alternative to white pasta for my husband and daughter to enjoy! Wondering if spelt could be the magic grain! I love it myself!! I’M Looking For An Alternative To Whole WHeat. My Kids Don’t Always Like The Texture. I’m interested in all things real and love an opportunity to try something new and healthy for me and my family. id like to try spelt pasta because i love experimenting with foods! My family doesn’t always like the texture/taste of whole wheat. Looking for some alternatives. Would love to try! Love anything spelt! I am interested in trying whole-spelt pasta because I enjoy spelt bread and am making positive health changes for my family. I have been taking the challenge to prepare healthier foods for my family. I would love to try the whole-spelt pasta in some of my family’s recipes. I have tried other alternative grains but not spelt – would love to though! I have heard that spelt pasta is a good alternative to regular pasta. I would love tot try and switch my children to a tasty pasta that is healthier for them. Thank you!! Heard about Spelt pasta last week from a co-worker. Very interested in trying. I like spelt flour and would like to broaden my horizons to spelt pasta. I also like that spelt gas not been engineered or altered by man, yet. Not spelt gas! Ha ha. I like that spelt has not been altered by man! We have been toying with eating less and less processed foods in our family and are ready to truly take the plunge. Always looking to try something new that is good for the family. I am very curious to try this pasta as I am also a new mom to real foods but honestly at first it wasn’t by choice! My exclusively breastfed son developed a list of food allergies at around a month old and little did I know what all I was eating until I had to start reading labels on everything! It really does scare me how many bad things are put into your everyday foods and also makes me wonder how we survived childhood ourselves! He has dairy/soy/corn/peanut/treenut/egg/strawberry and pineapple intolerances but thankfully he does fine with wheat! Now that we buy nothing but health foods I am wondering how much better this product would be for him rather than the plain wheat pasta I buy for him at the store. This sounds like a nasty grain to try and my girls love pasta! I’ve used spelt flour in recipes and I’ve loved it, so I would love to try the pasta, too! I am making an effort to eat an alkaline forming diet, and have read that spelt flour is good for this. I am always interested in trying new items for baking and cooking, and spelt would be great. I LOVE spelt! I try to get spelt any chance I can! I love that it is high protein and rich in vitamins and minerals as well as full of aminos and a non-tampered grain…done and DONE! When I can find spelt flour I stock up, it makes the silkiest breads ever! It’s definately one of my top go-to ancient grains. I’m a mother of 4 who would like to see if replacing wheat with spelt would help my family, especially as far as allergies/asthma. My son was just diagnosed with fpies a diagnosis which has hastened and deepened our desire and extent of whole foods. I would love to have some more variety in the good foods that we try to eat! I am trying to eat better and in the process getting the kids to eat REAL food. Since they looooove pasta, this would be a heaven sent solution. Thanks!!! I am just trying to take small steps to make my family healthier. I love finding new healthy things to feed my family. I giving them healthy choices, instead of junk good, which is what I consider regular pasta. My husband and I did a complete diet overhaul last fall when I was diagnosed with stage 4 endometriosis. Since the change we have felt so much better. I’m still learning about “new” real foods to try. I have never had spelt pasta. Would love to start incorporating it into our diet! I’m so excited to find an alternative to the ever-present wheat! Would love to try some mac and cheese with this! I would like to try spelt because it hasn’t been hybridized or chemically altered. Hi, for Search engine optimization genuine contents are truly required, if you only make a copy and paste then you can not rated in search engines. 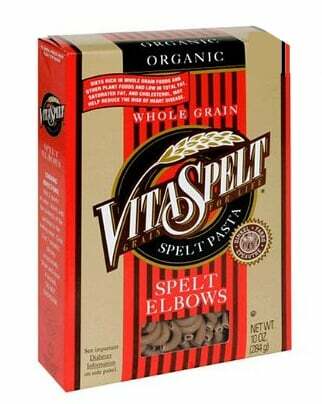 I love the hearty texture & earthy flavor of Spelt Pasta & have tried only the VitaSpelt brand for the last 6 years. I find its flavor really enhances tomato based sauces but is good in any pasta dish. Just sad I missed out on the giveaway!